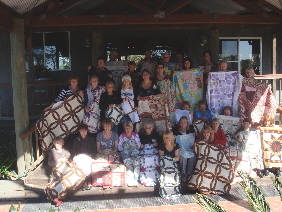 Well it has been a busy couple of weeks, however I did get to spend a most enjoyable time at Heavenly Patchwork’s Retreat up in sunny Queensland. 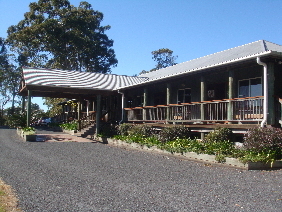 It was held at Tunnel Ridge Ranch in Landsborough just past Australia Zoo. 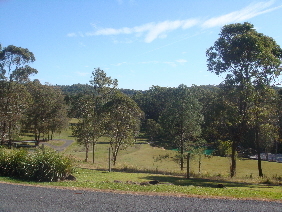 It was such a beautiful campsite that is used for school camps/retreats/school holiday camps and the owners Paul & Cheryl are such lovely hardworking people. Lisa, the owner, of Heavenly Patchwork in Clontarf was teaching some of the ladies a Double Wedding Ring Quilt and they did an amazing job. Others worked on their own projects. This is the pattern I designed for the Retreat in keeping with the “Wedding” theme. This is available as a pattern. I came home inspired, a little tired and very well fed (the food was delicious!). I am sure Lisa and her Mum, Kay, deserve a rest after such a busy weekend, they were so organised and the retreat was fantastic. Thanks so much for inviting me. 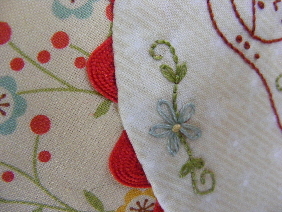 A little while back I may have shown a peek at one of my upcoming designs that was to appear in Creating Country Threads. Well it is in the current edition which is Volume 11 No. 12. I do hope you like it. 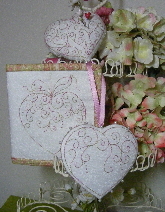 It was stitched using a variegated thread from Valdani called Vintage Pastel. These threads are colourfast and I love working with variegated threads as you don’t have to keep changing colours. I hope you get to spend some time this weekend doing the things you love. 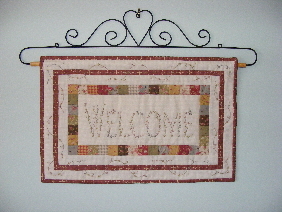 Here is a sneak peek of my project that will be sent out this month for Country Hart Designs “My Sewing Room” Project of the Month. 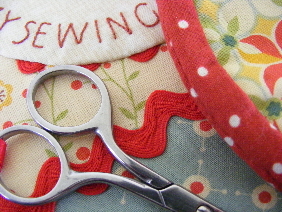 Robyn will be busy kitting up my project which will be sent out later this month. I hope you all like it. 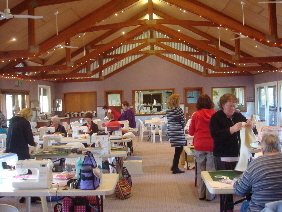 I’m sure there is lots of stitching happening with all the participants involved. I have enjoyed making my project for you all, so enjoy!!!! Well while our little zoomer, Jet, was trying to learn the finer things in regard to my sewing room he had a small encounter with a small tape measure that cost us more than a small amount of $$$$ to correct. He now comes with a four figure $price tag. This may sound a little cryptic, so to explain he was playing with a quarter inch wide tape measure which he decided tasted good so he ate about 5 – 6 inches of it. This of course upset his little tummy which then ended up in a big operation. He now knows a lot about stitches as he has quite a few in him. They will be removed this weekend, much to his despite, as he hates his little bucket collar that he has to wear. It has been a full-time job keeping him quiet and loved at the same time even though he has been isolated in a convalesence cage. He has been such a great little fella though. So warning for you all, don’t let kittens play with tape measures!!!!! !